Many people aren’t aware that a pre-built computer from a manufacturer like Dell or HP actually has two Windows product keys present, and the key on the Windows COA sticker isn’t actually in use. What your computer is shipped and installed with is a generic OEM product key that is the same on every computer that comes from the same manufacturer with that edition of Windows. You can test this yourself by using a product key display tool, the license it displays will not be the same as what’s on the attached sticker. Unfortunately if you perform a clean install of Windows you cannot ordinarily use this generic key and will instead have to use the one from the COA sticker. To prevent pirates easily using the key, measures are in place to make sure it only works on computers built by the manufacturer. Firstly, each computer has data added to the BIOS identifying the manufacturer. Secondly, a security certificate is installed into Windows which checks that identity in the BIOS and accepts the generic key. If the BIOS, certificate and key all match up, Windows will activate without the need for the internet or a phone. Many computers that came with Windows Vista and 7 will be getting old and if you still have the original install that came on the computer, you may be thinking about a reinstall as all Windows installs degrade and slow down over time. While you can use the product key from the sticker attached to your computer, after all this time many of those stickers will now be hard to read or the characters have rubbed off completely making the key unreadable. Thankfully there are ways to backup the OEM license key and certificate from a current Windows install and then transfer them onto a completely clean installation. ABR was originally designed to work on Vista only but support for Windows 7 was added in a later beta version. What it does is quite simple, extract and backup the currently installed OEM certificate and product key to a folder. You copy the folder onto a new system and the tool will reinstall the certificate and key. As the valid OEM data is still in the BIOS the computer will reactivate automatically. 1. Download ABR beta and run the executable which will extract the files to the location of your choice. 2. 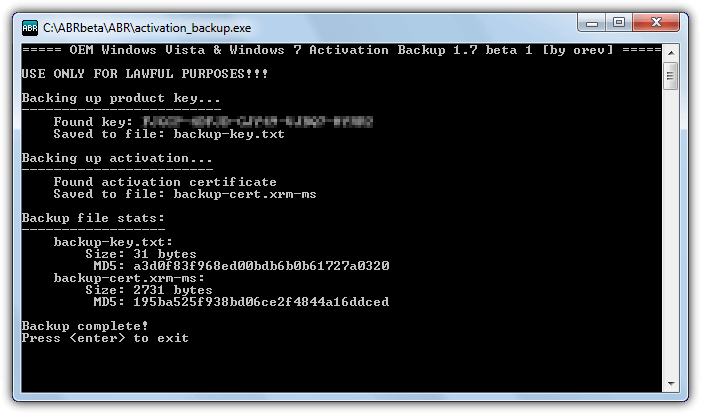 Inside the extracted ABRbeta folder, run activation_backup.exe (administrator privileges are required). The program will find and create a backup of the certificate and a text file with the product key in the same folder. 3. Copy the ABRbeta folder to a USB flash drive or another hard drive so you can access it after a new Windows install. It is important to note that you MUST install the same edition of Windows that is currently on your computer. 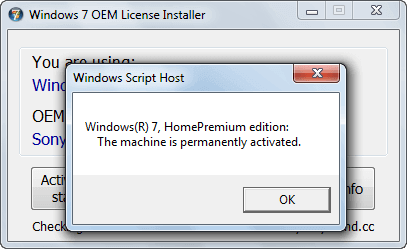 If your computer has Windows 7 Home Premium, you must reinstall Windows 7 Home Premium or the reactivation will fail. You can switch between 32-bit and 64-bit versions and reinstall Windows 7 64-bit when your original install was Windows 7 32-bit. The security certificate in Windows is not tied to a specific edition but the product key is. 1. Perform a clean reinstall of Windows 7 or Vista (the same edition that your computer shipped with). 2. During Windows installation do not enter a product key and choose to skip it. 3. Locate the ABRbeta folder on your system and run the activation_restore.exe. If you receive a message on Windows 7 that the tokens.dat file is not found and Windows may be already activated, just press y to continue. The certificate and product key will be automatically installed, if you look in System Properties (right click Computer > Properties) the Windows activation status should say “Windows is activated”. 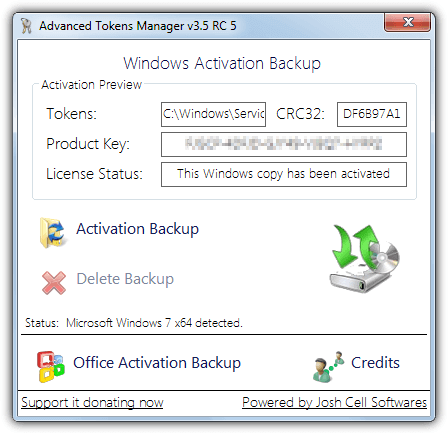 While the Activation Backup and Restore tool above allows you to transfer your OEM license from one install to another on the same computer, Advanced Tokens Manager will actually allow you to transfer standard Windows licenses that have been activated by phone or online as well, although certain conditions apply in those cases. It can also backup and restore Windows 8 and Office 2010/2013 licenses. 1. Download Advanced Tokens Manager and extract the zip to a folder of your choice, straight to flash drive or another hard drive would be best. 2. Run the program and click the Activation Backup button, administrator privileges are required. 3. Read the sizable warning popup and then click Yes to allow the backup to begin. After a few seconds the process will be complete and a folder called “Windows Activation Backup” is now at the location of the executable. Inside is a tokens.dat file which contains the security certificate and an INI file with the product key, Windows version and CRC checksum. 1. Reinstall Windows Vista or 7 with the same edition that was previously installed (switching between 32-bit and 64-bit is permitted). Skip the enter product key screen during the install process. 2. 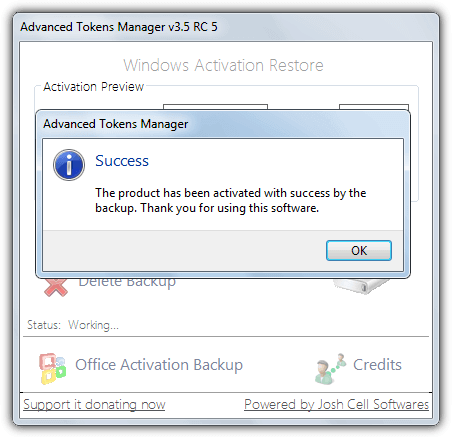 Run Advanced Tokens Manager and click the Activation Restore button. Note the warning popup says the process could take up to 5 minutes and all network connections will be interrupted during this time. When it’s complete System Properties will automatically be opened where you can check the activation status. Advanced Tokens Manager requires .NET Framework v4. This tool is something we made a few years back after constantly being asked to reinstall Windows 7 machines and the COA sticker attached to the computer was nearly always unreadable. The only other option besides using the OEM license would be to pay for a new copy of Windows 7. This program does not work on Vista but will automatically install the correct manufacturer OEM security certificate and product key to your Windows 7 computer. The useful thing about the Windows 7 OEM License Installer program is it does not need to make a backup first so if your current Windows install is unbootable or has been already erased, this tool will work where the two above will not. Currently Windows 7 machines from Acer, Packard Bell, eMachines, Advent, Asus, Dell, Fujitsu, Gigabyte, HP, Compaq, Lenovo, IBM, Medion, MSI, Samsung, Sony and Toshiba are supported. 1. Because this program doesn’t rely on backups, you can straight away install the same edition of Windows 7 that was installed on your computer by the manufacturer (32-bit <> 64-bit swapping is permitted). 2. 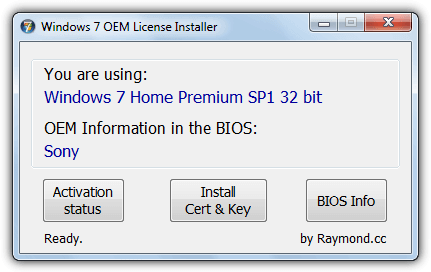 Download Windows 7 OEM License Installer, run the program and click the “Install Cert & Key” button. Then simply follow the prompts to install the correct security certificate and product key for your computer and version of Windows. If all has gone well the last popup will tell you Windows has been successfully activated. Note the program will only work if your computer has been manufactured from one of the companies listed above, if not it will fail to work and your install will not be activated. The Activation Status button will tell you the current Windows activation state, BIOS Info will run a separate included tool so you can analyze the system BIOS to see what manufacturer data is present. Windows 7 OEM License Installer will reactivate your OEM copy of Windows 7 Home basic, Home Premium, Professional and Ultimate. Of course we welcome any feedback, bug reports or suggestions regarding the Windows 7 OEM License Installer. 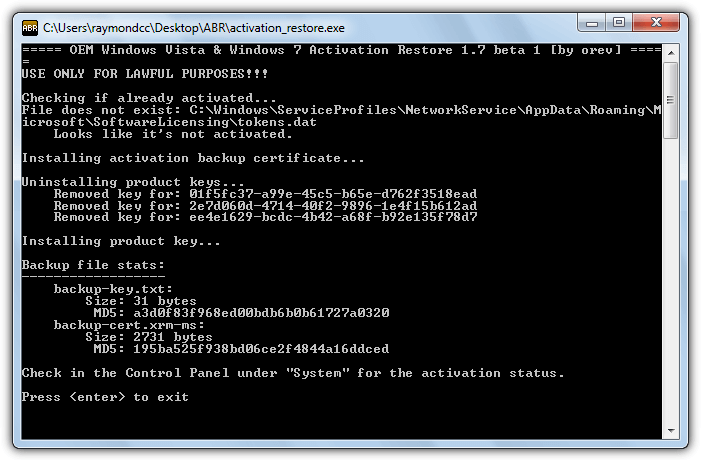 Does your tool Windows 7 OEM License Installer just install a generic Windows activation same as “Activate later” does? Over at herd protect I noticed that only this tool is flagged more than 0-2 times by their 68 scanners with just the last 30 files scanned shown. No, it fully activates Windows 7 like if you entered your own product key. The tool gets flagged by antivirus scanners for a few reasons, one is the programming language used to create it, the other is it’s a program that installs a file and data to legitimately activate the system, some scanners don’t like that and will automatically class the program as suspicious. Hello, i have a Win7 (Ultimate) x32bit installed in my PC through a Retail Disc i.e., Win7 Starter Disc. I had activated that version and now i have to re-install Win7 Ultimate because of some Disc indexing problem or disc error. I already have a backup of that Win7 Ultimate , can i restore that backup and then make a backup of that license copy through the tools that has been mentioned above and then can i install or restore it to my new Win7 Ultimate copy. Can anyone holler i really do not have a separate key for Win 7 Ultimate. My friend installed one time for me and i do not have another Ultimate key. Will it work that way. Hoping for some positive feedback. If your backup is properly activated then tool #2 will back up the activation and restore on reinstall. Alternatively, you can just use a key finder tool and copy the key, then reinstall and enter the key again. If the key is legit, activation will work fine. The other 2 tools here might work but it depends if your computer is an OEM one (Dell or HP etc). is there new version of the tool for windows 8.1 and windows 10? Windows 10 activation is tied to the system motherboard so you don’t need to reactivate manually because it’s done automatically. Hi. Is there any particular reason why it would fail at “There was an error installing the license file” ? Just after saying that “HP.xrm-ms was correctly installed” ? And it detects correctly that it is an HP/Compaq on the main window. Could this be used to: 1. Install Vista(using an ISO). 2. Use a Vista OEM license activation(Programs above) that is on a machine that I own(GIVEN). 3. Do a clean install with Vista on a better machine that has Xp SP3 and not really sure if the RAM in the XP machine is compatible with my newer Vista PC(only guaranteed to run properly on just 1 monopolized make of RAM and only supports a max of 2 GBs total, only 1 GB per socket). The newer machine is also having major audio and System Restore issues. 4. Restore this activation info on a clean install on what used to be XP(format it first)? If this worked, I could improve my RAM from 512 MB to up 3.512 GB(compatibility issues and max accepted RAM keeps me from adding these DIMMs to the newer machine), hopefully avoid any more issues upfront, increase the HD space from 120 -178 GB(if I chose the single PC route, XP HD space + Vista HD space), I would not have to buy any RAM sticks for the newer machine or anything else extra, and Vista is supported by Microsoft and XP no longer is(I would be using it for work) . Plus, if I ever need to upgrade from Vista to 7/8/8.1, the path is there to do so(Microsoft already appears to be pulling away from Vista–as you see almost as many W7 links as some of the newer WOS, but barely any Vista links). XP is a bit better than Vista(IMO), but Vista is where I need to be now. I’m thinking might as well use the better system. WILL THESE SOFTWARES ALLOW A FORMATTED HARD DRIVE FROM ANOTHER PC(PC2) TO BE INSTALLED WITH AND ACTIVATE VISTA BASED ON THE RESTORED ACTIVATION INFO FROM A PC1? In short, no, it won’t do what you are asking. The machine you want to transfer onto needs Vista to have been on it from the factory because activation information is stored in the system BIOS. If the target PC has a sticker with a Vista license then you could do it that way. You might want to reconsider installing Vista as it’s completely out of support in April 2017, which means it’ll receive no more updates and be vulnerable to the same extent XP now is. I’m assuming these tools query the BIOS, but they don’t write to it do they ? I’m just asking because I installed to an Optiplex with an MBR drive, but want to change to a UEFI drive for the clean install, after backing up the tokens or using your tool. No, they don’t write to the BIOS. Our tool simply reads data from the system registry, which in turn is read from the BIOS by Windows. Ok thanks (and thanks for fixing my dbl post). Just out of curiosity, can you say where the tokens and certs are located ? Perhaps it’s not for public disclosure, but I’m just curious to poke around and have a look. Anyway, thanks a lot for developing the tool. The Windows 7 certificate is stored inside it. I used you OEM activation tool on a Toshiba laptop with Windows 7 installed. Works without a hitch. Who ever the “Genuis” was that coded that piece of software, Thank you very much. I’d like to report how did the Windows 7 OEM License Installer worked for me. I had a Toshiba laptop that my father bought in 2010. It had to come with Windows 7 preinstalled and Windows XP on a DVD as a recovery solution, but I found there was neither a Windows 7 installation nor a recovery partition. The XP existing installation had all the Toshiba apps and drivers. I didn’t know what happened, but I wanted at least to use the Windows 7 I payed for. So I downloaded the OS from Microsoft with a good tool that gave me the link, then I installed it, after doing backups, repartitioning etc. I had no problems, except for the wireless card driver I had to download and install manually. Once installed I ran the tool. The process of license installation began, but after installing the license the tool gave an error popup. It was something like this: “There was an error while installing the license. The process cannot continue. Your Windows 7 copy hasn’t been activated.” I repeated the process other times, also with administrator privileges, but with no result. The SLIC BIOS tool said there was a valid licensing table. Luckily the sticker on the bottom of the laptop was still there and readable, so I inserted the product key written on it and at last I activated Windows 7. Maybe it was a problem of my computer, but I reported you this (perhaps) bug to help you improve this really useful tool. This is a great disappointment to me as I suffer from a pre-installed Win 7 that Toshiba did not provide me with a Windows Product Key for. This little program looked like an efficient solution. I hope this site has not been hacked or hijacked. No, there is nothing wrong with the file, it creates false positives because of what it does. I can assure you the file is 100% clean and I know every line of code in it. Of course you are free not to use it of you feel uneasy. It’s just unfortunate that like other tools (Nirsoft tools for example) it gets flagged as a hacking/modding tool by several antivirus. Then perhaps submit the file for all those malware/virus scanners to either white list themselves if they trust you enough or have them test it out and then come back with an answer whether they will white list it or not, because: virustotal.com/en/file/e8e1f679e26a106dc5da842adb5793ffae44aa0fe4de9eb4defab3fc885c0b5c/analysis/ and virusscan.jotti.org/en-US/filescanjob/qeg829sky9 don’t look too promising……. …or maybe you *don’t* want to because there IS something sinister going on that you don’t want all those brands to know about, mmm? 3/4 of the detections are from the included SLIC Toolkit. That tool has been around since 2010 and has been used by millions of people without issue. Yet the AVs on VT love to classify it as malicious without really knowing why. Download SLIC Toolkit 3.2 from the web to check and look around to see what others say about it. The other FPs are simply created by using the AutoIt scripting language, some AV software mis-classifies a lot of perfectly legit software because it was created in AutoIt. For example, a simple “Hello World” message box in AutoIt can create between 5 and 12 detections in VT. There’s no point reporting these because it’s been done by many people over the years, but the false detections always come back again. If you could point me to anything sinister you think might be going on, I will be happy to answer your questions. It only uses a built in Microsoft tool (Slmgr.vbs) and freely available .xrm-ms OEM license files. You or anyone else are welcome to pull this tool apart or monitor every single thing it does, but you won’t find any activity even remotely malicious. Hmm, your site appears to be legitimate and only advise *legitimate* work arounds – hell you even digitally signed your website/domain – that shows something that you care about us readers. I didn’t say the lite version was clean in VT but showing it produces 75% fewer detections because SLIC Toolkit is not included. Developers are fighting a losing battle with places like VirusTotal because they give the wrong impression programs are unsafe. The scanners used for these services are command line versions which produce different results to the desktops versions. For example, ESET at VT flags the original OEM installer as Win32/HackTool.SLICMod.C but my ESET antivirus says it’s clean. Read about the troubles the famous Nir Sofer of Nirsoft has had with false positives on his tools over the years to see the problem. CLI or GUI, doesn’t matter, don’t they both use the same definitions? Ay yes, I know NirSoft….I use their “HashMyFiles” program so I can hash my files and or verify file integrity. ☺ I don’t think that program has yet been popped up yet in a virustotal scan before…..but I remembering scanning the zip files and they were all clean…. Ok so if we can’t trust those scanner sites like virustotal and jotti and even our own anti-malware suites, who do we trust? “CLI or GUI, doesn’t matter, don’t they both use the same definitions?”. You would think so but the definitions in VirusTotal and those in your antivirus can be vastly different and produce very different results, as explained in the VirusTotal FAQs. These sites should be used as a pointer or extra piece of information, the results should not be taken as fact, which is what a lot of people wrongly do. Is there a tool similar to your awesome Windows 7 OEM License Installer that works on Windows Vista? Thank you. They maybe one out there but I never made one because there was no call for it at the time. Your best bet might be to look over at MyDigitalLife. Thank you. I’ll try it out. I’ve always seen your tech writings in the past and have used some., while some are too over my head. Thanks to writers like you and the age of the blogs. Microsoft secrets are expose and less money they are getting while they were trying to squeeze every penny they can from unsuspecting customers. You’re right and I agree with you. Microsoft doesn’t mind the customers because for them the most important thing is money. They try to get money in any manner and they use their “Commercial Policies” to get more and more money. Unfortunately in our society the unique thing that really matter for people is money. That’s pity. Hi Raymond, the download link for the Windows 7 OEM License Installer does not work. It ultimately resolves to raymondcc.r.worldssl.net/7_OEM_Installer.exe but the file is not available. I tried, too, and the link didn’t work. Can you post another working link, please? I’ve reuploaded the tool, try the link now. Thanks very much, I tried a minute ago and it worked. Great post i have really been looking for this tool for my laptop.But though i use vista,i still make backups online oftenly with safecopybackup.This because i know anything can happen to my laptop and i may lose my files and i also fear data recovery because they are expensive and so costly.But with safecopy,if i delet any file of mine by mistake,i can recover them back by just a few clicks. Each OEM disc installs everything that you see on that laptop. Including drivers. If you want a clean install, there are original untouched leaked images from msdn/technet. Just grab 1 and install the version that came with the laptop. Don’t forget to backup the activation data with this handy tool!. As for the drivers, check the Acer CD/DVD for an option to install the drivers in windows. Wow, exactly what I was looking for. Worked like a charm on an upgrade from Vista Business 32bit to 64bit. All I needed was the 64bit disc, which I found online – the rest is taken care of by this little program. It is a lot easier than my previous ways. Wao…. Thx Raymond :).